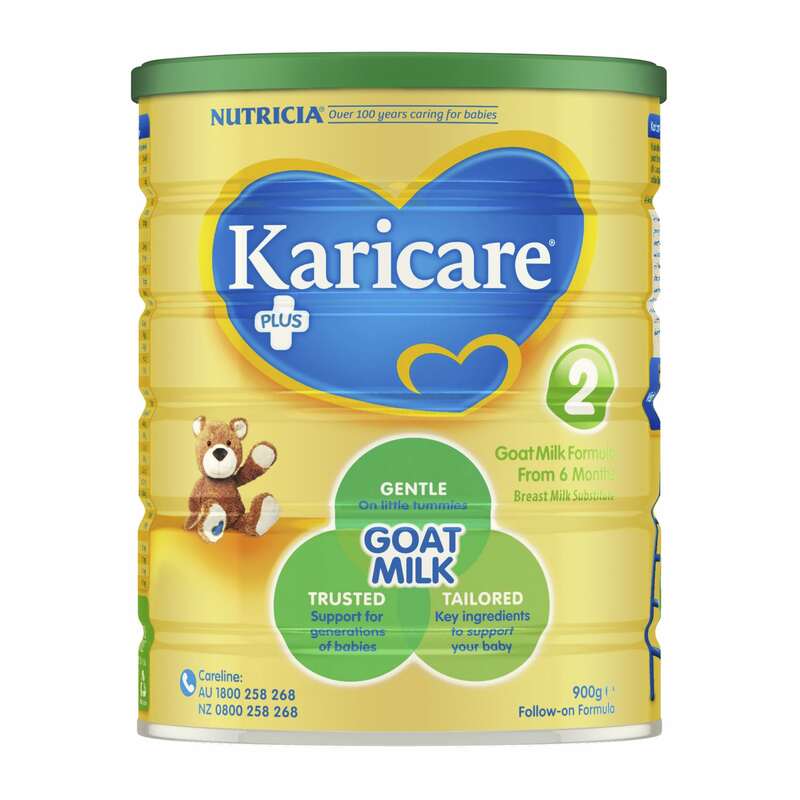 Karicare®+ Goat Milk Follow-On Formula is a premium goats' milk-based formula, designed with a balance of key ingredients for formula fed babies from 6-12 months. This formula is gentle on little tummies and is designed to complement the introduction of solids into your baby's diet. Follow instructions exactly. Prepare bottles & teats as directed. Do not change proportions of powder except on medical advice. Incorrect preparation can make your baby very ill. Infants over 6 months should be offered foods in addition to infant formula. Vitamin: Vitamins (A, B1, B2, B3, B5, B6, B12, C, D3, E, K1), folic acid, biotin. Minerals: Calcium, sodium, iron, zinc, copper, manganese, iodine, selenium, potassium. Vitamins: Vitamins (A, B1, B2, B3, B5, B6, B12, C, D, E, K1), beta-carotene, folic acid, biotin. 1. Wash hands before preparing the feed. Sterilise all utensils by boiling, for 5 minutes, or using an approved steriliser. 2. Boil safe drinking water and allow to cool to feeding temperature. Measure the required volume of water into a sterilised feeding bottle. 3. Use only the enclosed scoop. Fill scoop lightly & level off using built-in leveller. Avoid compacting powder. 4. Always add one level scoop of powder for each 50mL of water. Stir or shake briskly to dissolve the powder. 5. Test temperature on wrist before feeding. Feed immediately (do not store). Discard unfinished feeds. Prepare each bottle separately. For all brands of formula, it is safer to use immediately after they are prepared. Karicare+ Goats' Milk Follow-On Formula From 6 months 900g is rated 5.0 out of 5 by 5. Rated 5 out of 5 by KT77 from Great product! Great product!! my baby love it !